Conference communications director Dr. Larry Hygh, Jr. interviews Bishop Warner H. Brown, Jr., during General Conference 2016, click here. Conference communications director Dr. Larry Hygh, Jr. interviews delegate Greg Bergquist on the floor of General Conference 2016, click here. Conference communications director Dr. Larry Hygh, Jr. interviews delegate Karen Oliveto on the floor of General Conference 2016, click here. NASHVILLE, Tenn. (UMC.org) — General Conferences are part of the culture of United Methodists. Joe Iovino writes about the church practice that has shaped the denomination in the past and will lead it into the future. PORTLAND, Ore. (UMNS) — Not traveling to Portland for General Conference? Watch events live beginning Tuesday at umc.org/live. Photos are available for use with proper credit. United Methodist News Service will provide up-to-the-minute coverage that you can follow through the free Daily Digest. What will General Conference mean to my United Methodist church? PORTLAND, Ore. (UMNS) — Here is everything you need to know about attending General Conference 2016 — from the fact that the convention center will be a gun-free zone despite Oregon’s open carry law to how to get wireless, translations and public transportation information. The Rev. Dr. Kah-Jin Jeffrey Kuan is the 7th President and Professor of Hebrew Bible at Claremont School of Theology, beginning his tenure on July 1st, 2013. Before coming to CST, he was Dean and Professor of Hebrew Bible of the Theological School at Drew University from 2011 to 2013. He earned his Ph.D. in Old Testament studies at Emory University. Dr. Kuan’s research and teaching interests include ancient Israelite and Near Eastern history, Asian and Asian American hermeneutics, the Book of Job, as well as approaches to biblical instruction for the churches. Dr. Kuan previously served on the faculties of the Pacific School of Religion and the Graduate Theological Union in Berkeley, California from 1991 to 2010. He also served as Old Testament Editor for the multi-volume New Interpreter’s Dictionary of the Bible from 2006 to 2009. He was a member of the Council of the Society of Biblical Literature from 2007 to 2012. Dr. Kuan began his career serving as an associate pastor from 1980 to 1983 in Malaysia. In 2002, he became an ordained elder and full member of the California-Nevada Annual Conference of The United Methodist Church. He was the chair of his annual conference Commission on Religion and Race from 2006 to 2010. He is a two-time delegate to the General and Jurisdictional Conferences, in 2004 and 2012. He served as a director of the General Board of Higher Education and Ministry from 2004 to 2012, and as the Vice President of the board and chair of the Division of Higher Education from 2008 to 2012. He currently serves on the University Senate of The United Methodist Church and chairs the Commission on Theological Education. As a theological educator, Rev. Kuan is a strong proponent of religious pluralism and passionately committed to justice issues in the global and local contexts. As a biblical scholar, Dr. Kuan has long been a visible advocate for LGBT equality in churches and society. Beginning in the early 1990s, he has been teaching against the misuse of biblical texts towards lesbian and gay Christians. He served as an expert witness both in the investigation of the Sacramento 68, a group of United Methodist clergy, who co-officiated the holy union of a lesbian couple, and in the church trial of a lesbian clergy in Seattle. He has marched and spoken out publicly in rallies and press conferences, as an Asian Pacific Islander clergy in support of LGBT equality and marriage. He was honored by Asian & Pacific Islander Family Pride for “loving and supporting LGBT members despite sometimes strong social criticism and disapproval” in 2009. In 2004, the Reconciling Ministries of the California-Nevada Annual Conference named him the winner of the Turtle Award for “sticking his neck out” for the LGBTQ community. In 2011, the Conference Commission on Religion and Race of the California-Nevada Annual Conference presented him with the Melvin G. Talbert Award for Racial Justice. Originally from Florida, Rev. Greg Bergquist entered the ordained ministry after working as a systems engineer and manufacturing manager for Procter & Gamble. He has been an ordained elder for 30 years, serving churches in Georgia, Texas, and California in a variety of settings – rural, urban, and suburban. Since coming to the California-Nevada Annual Conference in 1993, Greg has served Los Altos United Methodist Church as executive pastor, First UMC of Santa Rosa as the senior pastor, and, for the past four years, he has been appointed to the Cabinet as the Conference Superintendent for Leadership Development. In addition, Greg has served the conference on the Board of Ordained Ministry for the past sixteen years in a variety of roles, including the Chair of the El Camino District Committee, Chair of the Conference Relations Committee, and the Cabinet Representative to BOOM. Greg has also served on the faculties of the Pacific School of Religion and Southern Methodist University, teaching in the areas of Historical Theology and Wesleyan/Methodist Studies. Greg and his wife Connie enjoy traveling, music, playing Scrabble and spending time with their two adult children, Jonathan and Susanna. Greg is also an avid photographer and cook. Rev. Dr. Karen Oliveto is a scholar/pastor/activist. A 1980 Master of Divinity graduate of PSR, Oliveto also holds a Master of Philosophy and Doctor of Philosophy in Religion and Society from Drew University. She has served in urban and rural settings in both parish and campus ministries on the East and West Coasts. Oliveto was the Associate Dean for Academic Affairs at PSR from 2004-2008. She left PSR to break the “stained glass ceiling” when she was appointed as the senior pastor of the 11,000 member Glide Memorial United Methodist Church, becoming the first United Methodist clergywoman to serve as lead pastor in one of the top 100 largest United Methodist Churches. In addition to her parish work, she is an adjunct professor of United Methodist Studies at Pacific School of Religion and has also taught at Brite Divinity School and Drew Theological School. Oliveto grew up in the New York Annual Conference where she was active in her home church, Babylon, on Long Island. She served her first church in rural upstate New York. Since joining the California Nevada Annual Conference, she has volunteered in the camping program, served on the Committee on Investigation, mentored ministry candidates and has been a member of the Study Committee for an Inclusive Conference. Oliveto has been an outspoken activist for LGBTQ justice in church and society for nearly four decades. A board member for California Faith for Equality, which engaged faith communities around issues of LGBTQ inclusion and marriage equality, she also served on the board of directors of the Reconciling Ministries Network in The United Methodist Church for twelve years, chairing the board for three years. She has led legislative efforts to change UMC policy on LGBTQ persons for several General Conferences, and was arrested for civil disobedience at GC 2000. During San Francisco’s “Winter of Love” in 2004, Oliveto married nine couples from her Bethany UMC congregation. She officiated at the very first legal marriage to be held in a United Methodist Church. A highly sought-after preacher and workshop leader, she has also published many litanies, articles, and chapters for anthologies. She is a co-author of Talking about Homosexuality: A Congregational Resource (Pilgrim Press: 2005), written with Rev. Dr. Traci West and Rev. Kelly Turney. Her blog can be found at karenoliveto.blogspot.com. A lifelong United Methodist, I started actively participating in church life through children's choir and VBS. In high school I joined two church committees, but it was in college that I first appreciated the church’s national and global connections. From the UC San Diego Wesley campus ministry to the UM Student Movement’s national Student Forum to serving as the Western Jurisdiction young adult representative on the newly formed Division on Ministries with Young People of the General Board of Discipleship, 2004–2008, it was an eye-opening series of experiences. Bishop Brown served on that Division with me, and when he moved to our conference he recommended me to assist with and then take over the Agenda Chair responsibilities for Annual Conference Session. I am serving a quadrennium on the General Commission on Communication (aka United Methodist Communications). At my home church, First UMC of Palo Alto, I am on the Staff-Parish Relations Committee. My day job is Director of Communications at Los Altos UMC, where I am pleased to combine my passions for communications and the United Methodist Church. Burt P. Yin, ED.D, is a second generation Californian born and blessed with all his life experiences thus far in California. He is an active member of the Chinese Community United Methodist Church, in Oakland Chinatown. With his over fifty years of experience as an active layperson at his church, he has chaired various committees and boards, participated in youth and adult fellowships and sang in the choir. It was during his 36-year professional career in elementary education in the Oakland Unified School District, first as a teacher for six years and then as a principal of 30 years, that he also earned his Doctorate of Education degree with an emphasis on organization and leadership in multicultural education. He currently shares leadership responsibilities as Conference Co-Lay Leader of the CA/NV Annual Conference. His continuing call to lay servant ministry, to preach the Gospel to all the world, begins first with his family, then to his church and community and to the global community. His passion is “to love the Lord my God, with all my heart, soul, mind and strength and to love my neighbor as myself”. He also lives his life committed to Jesus Christ following the teaching “to do justice, love kindness and to walk humbly with your God”. I believe my over fifty years of experience as an active lay person in the UMC empowers me to bring about a more inclusive perspective to the mission and ministry of our pluralistic denomination and prayerfully advocate the current issues of social justice and equality. Our beloved Church must address and resolve these pressing issues if we are to nurture and grow one another as beloved disciples. I believe I am able and competent to serve as a lay delegate to General and Jurisdictional Conferences. Along with his UMC responsibilities, he continues to be involved in various leadership positions with the American Red Cross, Disaster Response Teams, both locally in the Bay Area as well as assisting in national disasters. Among his varied hobbies of hiking and biking and playing the piano and the ukulele, he enjoys singing bass in the barbershop harmony style. An active, seminary-educated layperson, Randall has been tapped to represent the Western Jurisdiction in a variety of leadership and ministry settings. 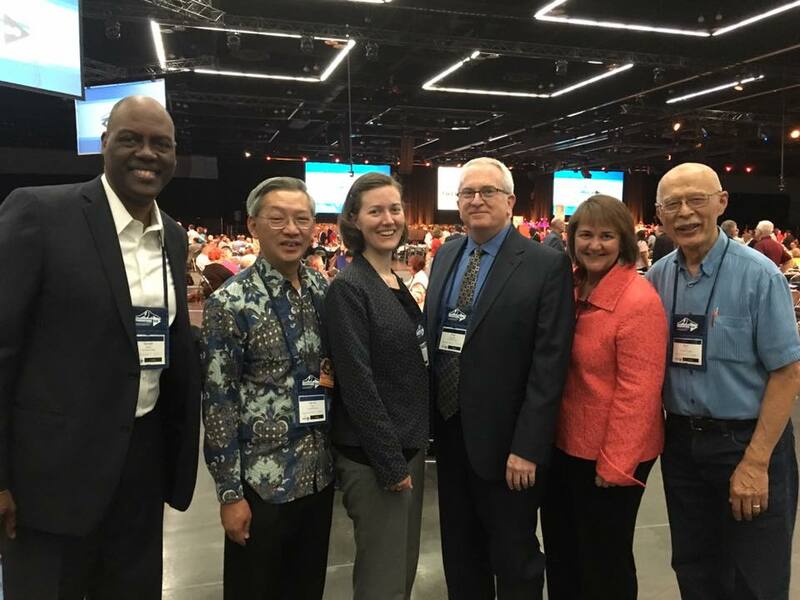 In this regard, he has served as a director for the General Board of Global Ministry and the General Board Church and Society as well as on the executive committee of the United Methodist Committee on Relief. Randall was also previously elected as a member of the former Commission on Rules and Plans of Order, and, following this, became chair of the Commission on the General Conference (2012-2016). In 2012, Randall was also as the third lay alternate to the United Methodist Judicial Council, the “Supreme Court of United Methodism,” and moved up to become first lay alternate following several resignations from the Council. As a social justice activist, Randall is passionately committed to ending all forms of exclusion, but has given very specific leadership to the full inclusion of LGBT people within the Church as well as the larger society. In this capacity, Randall has been formally invited to address the General Conference on issues of inclusion at least three times over the past twenty years (twice from the podium and once from the floor). Additionally, in the late 1980’s, Randall served as one of the two national spokespersons for Affirmation, the unofficial LGBT caucus of United Methodism, and, much later, gave eight years of board service to the Reconciling Ministries Network. Professionally, Randall’s career has included senior and executive leadership positions in advocacy, philanthropic, and academic institutions. Among other positions, he has served as a co-director of the National Youth Ministry Organization, a national policy coordinator for the Jesse Jackson ’88 Campaign for President, the executive director of the National Task Force on AIDS Prevention, the Associate Director of Philanthropic Services at the Tides Foundation, and Senior Program Director at the Haas Jr. Fund. Following his departure from the Haas Jr. Fund, Randall stepped away from his work in advocacy and philanthropy to teach and mentor students at the Pacific School of Religion (PSR) in Berkeley, CA. Having received a PhD in ethics and social theory in 1998, PSR provided a much sought after opportunity to put his academic training to work. During his five years at PSR, Randall taught United Methodist studies, ethics, leadership, and social justice, helped to create the Center for Spirituality and Social Change, and led the very first cohort of Changemaker Fellows. Randall’s time at PSR concluded with a stint as the interim Vice President and Dean of Academic Studies. Currently, Randall holds an appointment as the Director of Global Religions at the Arcus Foundation, where he manages a $3.5-$4.0 million giving program that supports religious leaders and faith-based organizations, around the world, working in the context of the Abrahamic faiths (Christianity, Islam, and Judaism) to increase LGBT acceptance and opposed religiously-grounded homophobia. Randall currently splits his time between a small apartment in Manhattan and his home in Oakland, CA, where he lives with his partner and spouse of twenty-five years, Glenn Eagleson.